Describe the basic structure of a lipid. Identify the small molecules that are important for cellular function and their roles. Lipids are molecules with two personalities. One part of the molecule wants to associate with water and the other does not. Molecules with these properties are termed amphipathic. Figure 2.29 shows that the backbone of the lipid consists of a three-carbon glycerol molecule. Hydrophobic, long-chain fatty acids attach to two hydroxyl groups on the glycerol. To the third hydroxyl group, a polar, and therefore hydrophilic, group is attached. Many bacteria contain phospholipids in which this third group contains a phosphate connected to a carbon molecule. The amphipathic nature of lipids is important in their function in the cell. Figure 2.29. The structure of phosphatidylethanolamine. 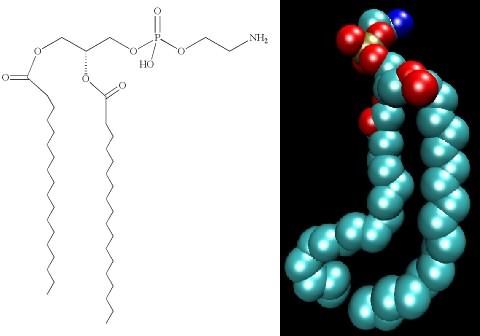 The chemical structure (left) and a space-filling model (right) of phosphatidylethanolamine. Figure 2.30. A hopanoid. The chemical structure and space-filling model of a hopanoid, which is found in many different bacterial membranes. There are also a number of important small molecules that shuttle protons, electrons or small carbon moieties around the cell. These small entities typically do their job in association with proteins to which they can be either loosely or tightly bound. All of life on this planet seems to have settled on a surprisingly small set of molecules to perform these tasks. Almost certainly this is because the use of these molecules evolved early and has been maintained through evolution. Most amino acids are not particularly good at either donating or accepting electrons and when they do, it is under a limited range of conditions. As you will read in the chapter on metabolism, the ability to move electrons among proteins is critical to all life, so two general types of prosthetic group associated with proteins have evolved for this purpose. Figure 2.31 shows the two types of structures that are commonly used to shuttle electrons, organic multi-ring structures and iron-sulfur clusters. In both cases, these carriers have characteristic affinities for accepting and donating electrons and protons, but these affinities are also affected by the proteins in which they are found. Thus, a wide range of electron carriers with different properties has evolved. By organizing these carriers in precise patterns in the cell, the cell is able to use the transfer of electrons to do work. Figure 2.31. The structures of a few important electron and hydrogen carriers. The chemical structures of quinone (a) and nicotinamide adenine dinucleotide (NAD) (b) are both organic electrons carriers. The cell also has the need for inorganic electron carriers, most often Fe. The structure of an Fe-S center is shown in (c). In each case, both structures the oxidized and reduced forms are depicted. There are also small molecules in the cell that serve as carriers of important carbon compounds. Essentially, these carriers have the right chemical properties that make it relatively easy for enzymes to add or remove a particular carbon unit. Tetrahydrofolate and cobalamin (vitamin B1 2 ) are often involved in adding or removing one-carbon units during the synthesis of various structures in the cell. Coenzyme A is necessary for the transfer of small 2 to 4 carbon units (acetyl, propyl) from one enzyme to another. It finds utility in both the synthesis and breakdown of organic molecules. The beauty of using a small set of carriers is that it allows the easy movement of carbon from one pathway to another. Many types of minerals are important for the proper functioning of enzymes. For example, magnesium ions are essential for ATP-binding by many enzymes. Zinc is important in the proper folding of some enzymes and iron, in the form of iron-sulfur centers and hemes, is critical in many electron transport proteins. Minerals also help bind structures in the cell together. For example, magnesium and calcium are necessary for the stabilization of membranes. Potassium ions in the cell shield the large amount of negative charge on the DNA allowing it to pack more tightly together. More will be said in later chapters about their specific roles, but some of the more important ions include K + , PO4 -3 , Mg +2 , Zn +2 , Ca +2 , Mn +2 , Fe +2 and Fe +3 . Microbiology is constantly changing. Most of what we will discuss consists of well established principles and it would be very surprising if these changed. However, we have tried to keep this book as much on the cutting edge of the science of small things as possible. When you live this close to the edge, you are bound to get some cuts and some of what you read here today, could change when more is known later. Keep that in mind. Membranes have lipids as their major constituent. Lipids contain a glycerol backbone. To this backbone are attached a polar group and two long-chain fatty acids. NAD and FAD are two common proton and electron carriers in the cell. Inorganic Fe-S centers are also important electrons carriers. Tetrahydrofolate, cobalamin and coenzyme A are common carbon carriers in the cell. Many enzymes require minerals for proper function in the cell. Common examples include, iron, zinc, magnesium, and calcium. 1. Lipids would still be useful in forming membranes even if they did not have a polar group on them. 2. Metal ions like Mg+2, Zn+2, Ca+2, Mn+2, Fe+2 are all very small and have the same charge, therefore they can substitute for each other in binding to specific proteins and supporting biological processes?